Having had the pleasure and opportunity to meet and watch Manolo at work, it is clear to me the immense benefits and great depth of knowledge that this individual has in the field of equine health. It is essential as a practitioner in my field that we not only treat the stationary spine but also ensure measures are put in place to support,strengthen and train the athlete to further prevent musculo skeletal dysfunction. Manolo has an innate sense of understanding in the way the horse should move freely and unencumbered. This knowledge allows him to recognize even the smallest amount of tension in the body and correct the horse enabling him to train with the least resistance possible. We owe our equine friends respect and an approach to training that ensures their long term health over short term results.It is my strong belief that Manolo’s training in all its forms, in hand and under saddle, encompasses all this philosophy and more. 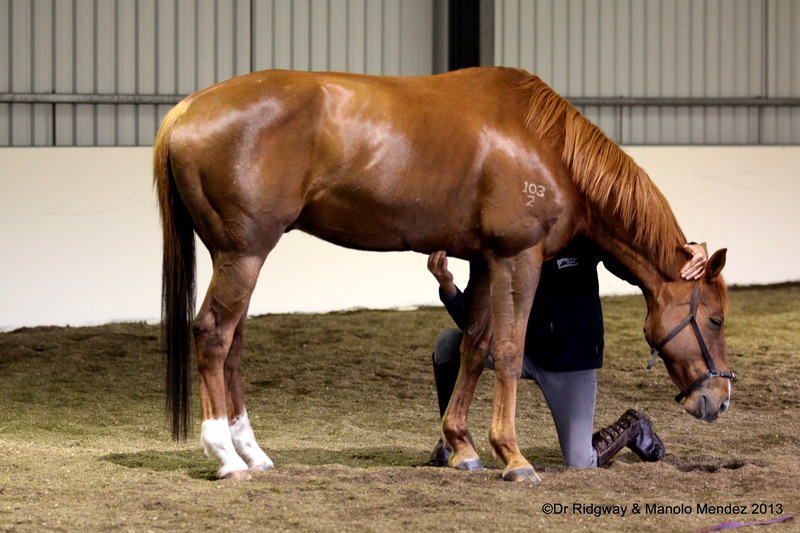 Manolo Mendez has an unparalleled ability to locate underlying imbalances within the horse’s body which directly contribute to performance issues, pain and lameness. His training techniques are the most effective I have seen to re-educate the horse within its own limits; he is able to remove restrictions, improve locomotion and proprioception, and allow the horse to attain balanced, happy and athletic performance. I have worked in the equine rehabilitative field since 1995, and there are few equine professionals that achieve the outcomes that Manolo Mendez achieves on a regular basis. MY FIRST HAND EXPERIENCE: I am so thrilled with the changes in my mare after a few months of proper in-hand work. She is finally able to initiate the walk from a hind limb, which she was completely unable to do six months ago. Situation: My mare was “auction prepped” as a youngster and as such, she has had a propensity for using her shoulders in all movements to pull herself around rather than use her hind legs to step through. She was not using herself properly. Program: After watching Manolo at the clinics and studying his in-hand DVD, I started playing with her. We worked initially on always stopping with a square halt and in a good posture, with her neck forward, down and out, her eye between her hip point and stifle and her gullet soft and open. I watched which foot she would stop on and then touched her gently behind the fetlock to “lift” that foot with the bamboo and place it forwards as she started to walk. I then halted and rewarded her. Result: In the past, she would only start walking with a front foot but with a few months of steady and slow work now that she is more used to dropping her poll and allowing herself to move forward, she is able to maintain her balance and step through her body, stepping forward with a hind foot first. It is a very exciting change. A large part of my therapy work over the past 16 years has focused on improving movement and performance in horses that do not have any obvious injuries or other issues that warrant veterinary attention. Despite some minor differences, there has been a common theme of overall braced musculature in most of these horses, regardless of breed and the type of work for which the horses are used. Generally, the primary cause of most issues can be traced to one or more of the following four points of origin; dysfunctional feet, teeth problems, poor saddle-fit and inappropriate training methods. If the horse is uncomfortable anywhere in his body, he will respond by tensing, or bracing, muscles in an effort to relieve the discomfort. Once the hoof, teeth and saddle problems have been resolved it is essential for the horse to be handled and trained in a manner that allows him to be fully relaxed mentally and emotionally. An anxious or frightened horse will brace his muscles in the same way as a horse feeling pain or discomfort; neither horse can carry a rider effectively or safely. For nearly 20 years I have seen that keeping the horse relaxed and happy is a priority for Manolo Mendez as he understands that no progress can be made in training and building a strong horse unless the horse is comfortable and free of all tension in mind and body. Manolo also understands deeply the functional anatomy of the horse; he knows how each horse should move within the limits of its individual conformation and structures his in-hand and under-saddle training to meet the needs of each horse. The softness and feel that Manolo employs with all horses results in a relaxed, strong, free-moving animal whose full potential can be reached. Manolo’s in-hand and under saddle work is effective for rehabilitating horses with muscle, bone and ligament/tendon injuries and issues. Since learning of Manolo’s techniques, I have shared many of the ideas with my clients, to benefit the strengthening, straightness and balance of their horses. The in-hand work, I have found especially beneficial for the resulting hindlimb angulation abnormalities, especially those not tracking straight with medial hindlimb muscle shortening. By placing the bamboo between the hind limbs and asking for a bend to the opposites side to which the handler is working, this helps convey to the horse, movement that has been ‘forgot’ due to injury, conformation or bad training. The way he works with previously abused or mistreated horses and establishes trust, is inspiring for those with horses with these issues – they become willing participants and interested in learning and developing their potential again. Manolo’s understanding of how to enhance the natural beauty and bring the best out in the horse, shows in his ability and techniques to get the horse stepping through and under more. There is only so much as a veterinarian /bodyworker can do in the rehabilitation process, the rest is up to the trainer. Rehabilitation not only of individual muscle groups in affected areas, but also the whole horse, is something Manolo reiterates – you are not training a part of the horse, but the whole horse. To have insight to share with clients, from one who has studied and worked with horses at Manolo’s level, leaves the client feeling they have the ability, or at least where to investigate further, for strengthening and rehabilitation/training, that is effective and beneficial in the long term to the horses.